This new work consists of laboratory analysis of 166 drill core samples (including standards and duplicates) by ALS Chemex. 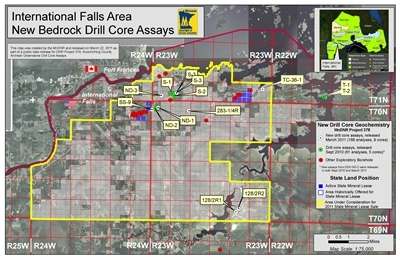 The samples were selected from 9 drill cores that had been drilled during the 1980’s, primarily by exploration companies searching for gold and base metals. Drill core and related exploration data are currently available at the Minnesota Department of Natural Resources Drill Core Library in Hibbing, Minnesota. Sampling was guided by re-logging of the core and also by the use of a hand-held X-Ray Fluorescence (XRF) analyzer instrument. Files contain these new sample assays including standards and duplicates, new core logs, XRF data and core locations. In October of 2012 the final report for Project 378 and related digital files was released. The Project 378 drill cores are located within an accessible Archean greenstone terrane near International Falls, Minnesota. The Quetico fault system is prominent in this area. Besides low-grade gold mineralization, the chemical data and logging identified thin sphalerite-bearing intervals and abundant tourmaline (see Figure 1 in P378 Report, for drill core locations). Data includes laboratory analyses of 231 analyses including 217 drill core samples, duplicates, and standards, by ALS Chemex. The samples were selected from 13 drill cores that had been drilled during the 1980’s, primarily by exploration companies searching for gold and base metals. Drill core and related exploration data are currently available at the Minnesota Department of Natural Resources Drill Core Library in Hibbing, Minnesota. Sampling was guided by re-logging of the core and also by the use of a hand-held X-Ray Fluorescence (XRF) analyzer instrument. The hand-held XRF targets a circular area of 0.76 cm2 , providing semi-quantitative chemical data at a scale between chemistry lab analyses (over feet) and microprobe (over microns) chemistry. The scale is ideal for smaller features, and is amenable to creating comparative traverses across veins and lithologic contacts; and comparative chemistry, with and without, small features such as sulfide blebs. Zinc is present in small amounts in some drill cores in this area. It has been reported elsewhere that zinc may interfere with the XRF gold analysis and cause the gold content to be over-estimated. Therefore, we emphasize that these XRF analyses are semi-quantitative and are used as a tool to refine the logging and sample selection for traditional chemical analyses and fire assays. This data released supersedes previous data releases for Project 378, including September 2010 and March 2011 data releases for this project. That data has been archived internally by the DNR. "Gold Mineralization Potential in a Wabigoon Subprovince Granite-Greenstone Terrane, International Falls Area, Minnesota"